Pakistan's National Assembly comprises a total of 342 members, of which 272 will be directly elected whereas the rest 60 seats reserved for women and 10 for religious minorities are selected later through proportional representation among parties. The people of the troubled-Pakistan is voting to elect their new head of the state. The voting began at 8 am local time on more than 85,000 polling stations. The counting of votes will be done on the spot soon after the conclusion of the polling process at 6 pm and results will be announced within 24 hours. While more than 30 political parties are in fray, the main fight is between three political outfits - Pakistan Muslim League-Nawaz, Pakistan Tehreek-e-Insaf and Pakistan People's Party. Election is happening for the National Assembly and Provincial Assembly. The country has over 105 million registered voters - 59 million men and 47 million women - who can cast their votes for two seats (one for national and one for provincial) in each constituency. The country has four provinces: Sindh, Balochistan, Punjab and Khyber Pakhtunkhwa. To ensure smooth polling, the Election Commission of Pakistan has deployed around 1.6 million staff at polling stations across the country. About 449,465 policemen and over 370,000 military personnel have been deployed for security. According to the Election Commission of Pakistan, 3,459 candidates are contesting for 272 general seats of the National Assembly, while 8,396 candidates are running for 577 general seats of the four provincial assemblies. Pakistan's National Assembly comprises a total of 342 members, of which 272 will be directly elected today whereas the rest 60 seats reserved for women and 10 for religious minorities are selected later through proportional representation among parties with more than five per cent of the vote. In Pakistan's 342-member National Assembly, a political party must secure 172 seats to obtain and preserve a majority. However, reports based on opinion polls suggest that no party is in position to get the majority in the assembly. Recent survey and polls showed that Nawaz Sharif's PML-N and Imran Khan's PTI were in neck-and-neck fight, therefore heading for a hung assembly. However, Imran Khan is slightly ahead in most favourite leader's list. Like others, this election too was marred by controversies and allegations. Just few days before the election, a high court judge accused the country's spy agency of meddling in the affairs of the judiciary and pressuring the chief justice and other judges to get favourable verdicts in the elections. In a video which went viral on social media, Justice Shaukat Aziz Siddiqui of the Islamabad High Court had alleged that the officials from Inter-Services Intelligence was wanted to keep only pliant judges in the bench to make sure that ousted former Prime Minister Nawaz Sharif does not come out of the jail ahead of the poll. "ISI approached my chief justice and said we don't want Sharif and his daughter out [of prison] before the polls" Shaukat Siddiqui had alleged. This week, thousands of PML-N supporters staged a protest outside the headquarters of Pakistan army. The Pakistan military's role came into question after an anti-corruption court in Islamabad earlier this month sentenced Nawaz Sharif to 10 years in prison. 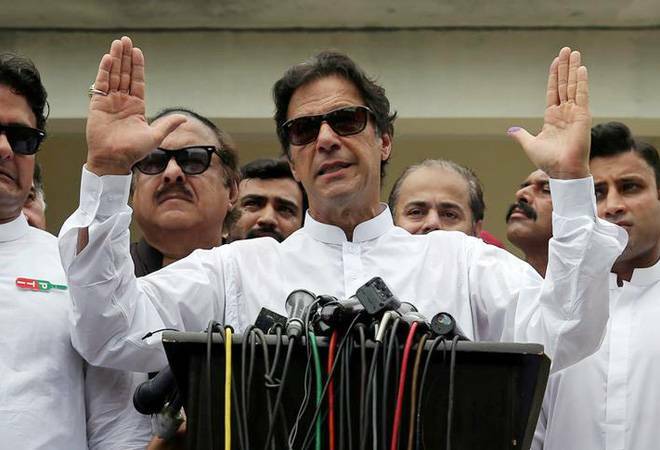 In the run-up to the elections, there were allegations that the army secretly backed the campaign of Imran Khan while targeting his political opponents. The Pakistan military has ruled Pakistan through various coups for nearly half of the country's history since independence in 1947. Even during the civilian rule, the generals have wielded enormous power, setting the agenda for the country's foreign and security policies. Meanwhile, an Islamic State suicide bomber blew himself up outside a polling station killing 31 people in Pakistan's southwestern Quetta city today and four others were murdered in poll-related violence as the country went to polls to elect a new government. The suicide bomber blew himself up after he was stopped from entering the Tameer-i-Nau Education Complex school, which is serving as a polling station in 'sensitive' NA-260 constituency in Quetta, the capital of Balochistan, police said. Earlier reports had said the bomber targeted a police van. At least 31 people, including five policemen, were killed and 60 others injured in the blast in the Bhosa Mandi area of the provincial capital.